Arturo Fuente Brevas Royales Maduro are handmade in the Dominican Republic and rolled by some of the world's most skilled cigar crafters. Each cigar offers a smooth smoke, full in flavor and easy to relax with. If you're looking for a nice smoke to shake the day off then this is it! A good everyday cigar. Good flavor and a really low price. Ordered on Dec 29 arrived on Jan 8. Packaged well & not dried out. This is a good everyday cigar or maybe something for a newbie. This has become my everyday cigar, Very mild, burns well, great aroma and the price is good also. You won't be disappointed....!!! 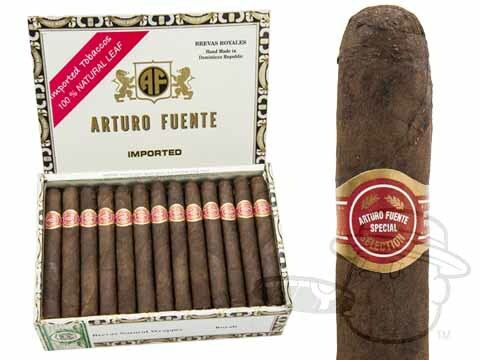 Arturo Fuente Brevas Royales Maduro is rated 3.4 out of 5 based on 6 customer ratings.